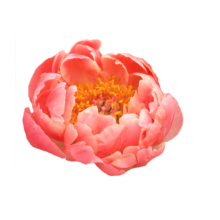 Paeonia Coral Charm is a peony variety known for its colour transformation while blooming. Because of this spectacular attribute Corals belong to the most popular varieties. The best property of Coral Charm is that its colour transforms from coral to cerise, orange and, finally, white. Besides changing colors they have thick stems that can be cut into longer lengths if desired. Last but not least the semi-double flowers are immense and can reach easily 18 cm. Coral Charm has no fragrance. Samuel Wissing registered this variety in 1964. Wissing is famous for his colour changing varieties. In 1986, Coral Charm was awarded the APS Gold Medal. Coral Charm is highly recommended to lovers of colour changing peonies. Because they are semi-double they might not last as long as double varieties. Therefore it will be a good idea to refresh the water and keep it cold.